Ready for everything from daily dining to special family celebrations, the Amish Woodmont Single Pedestal Dining Table shines as part of your dining room furniture collection. The base of this pedestal table is a sight to behold, looking regal with gentle waves built into the rounded base. 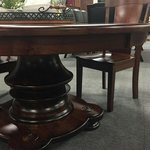 Exceptional construction by our Amish craftsmen ensures the table base is perfectly proportioned to support the graceful table top that your family will gather to dine at. 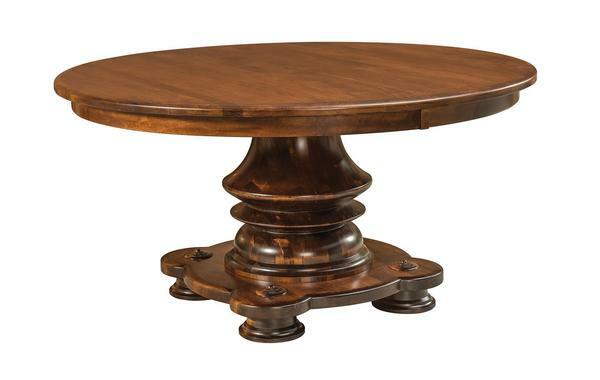 The single pedestal dining table is a classic choice for a smaller dining room or kitchen nook area. The absence of legs makes it ideal for fitting an extra person around the table when you gather. The Woodmont Single Pedestal Table embraces its formal design with flowing curves and fluid lines. Exuding elegance from every angle, this is the dining table that looks dressed up without anything on it. Every meal feels like a special occasion around a formal dining table like the Woodmont. View more of our Formal Furniture Collection for other areas of your home. The Amish Cameron Dining Room Chair makes a lovely match around this solid wood pedestal table. The Woodmont is offered in two custom sizes to provide you with a perfect fit. Choose either a 54", 60" or 72" round table top. We offer nine different woods for this table. Choose from a variety of stains and order samples to work with as you decide.